You know how they say if you do something for 21 days in a row it turns into a habit? Well, I thought it might work that way for me with blogging, but it didn't. Funny. Guess I'm going to have to put blogging into some sort of order along with most everything else in my life. It's like when you draw a spatula through thick batter and the batter separates to make room for the spatula, but as soon as you remove the spatula the space fills right back up again. That's how it was with me and blogging every day in October. On November 1 the space filled right back up again! We haven't been doing nothing over here at A House and Yard, though. Brian has been working on the sunroom and I will have an update in a day or two. I've been collecting pieces to finish the little reading space in my room, and hope to have an update for you sometime next week. And now for the big news! 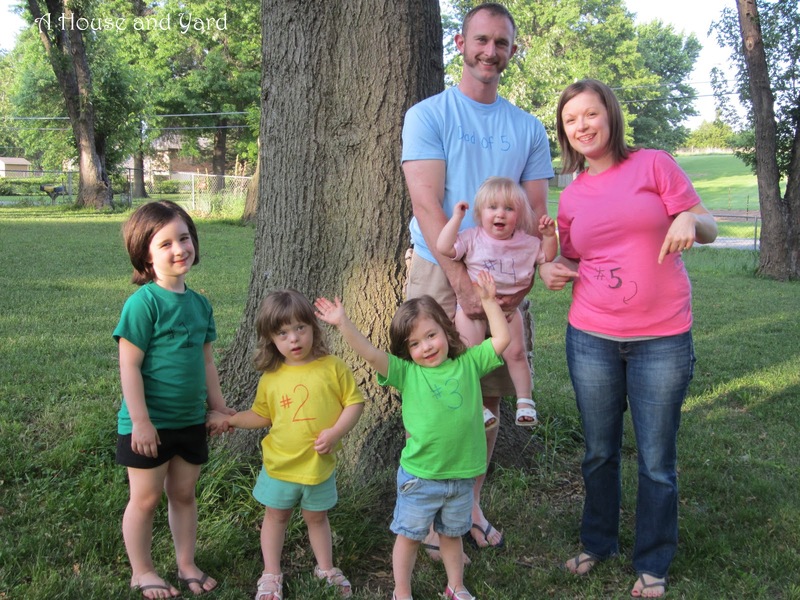 The project that has consumed a fair amount of my time recently is planning a baby shower for my oldest daughter, Sarah, who is expecting their 5th (yes, I said 5th) child. Only this time around, it's a boy! One afternoon this summer they showed up at our house wearing these t-shirts to make their new baby announcement. Aren't they all so cute? Anyone care to guess how many pictures I took in order to get this good one? We are going to have an amazing party and I simply can not wait to share with you the details, but I'm saving it. So far as I know, we've been able to keep our shower theme a secret from Sarah. 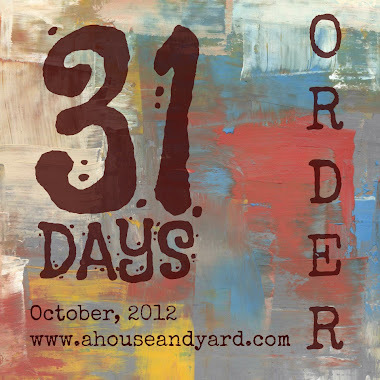 You will have to wait until Monday! 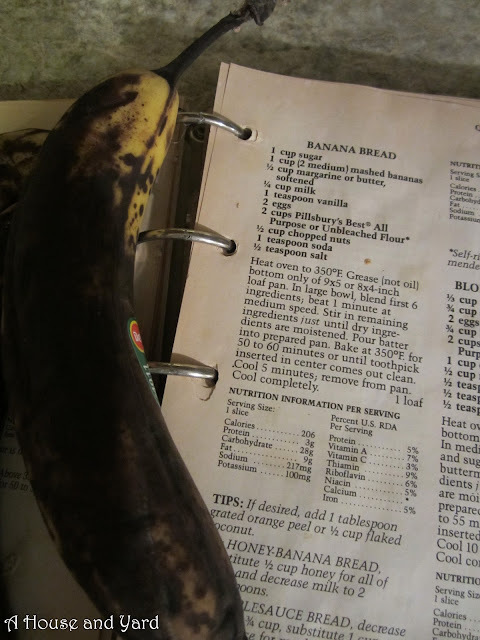 Are you wondering about those bruised apples and black bananas? Well, I had some Jonathans in the fridge that needed attention before they went bad and the bananas were turning into a syrupy mess on my counter. 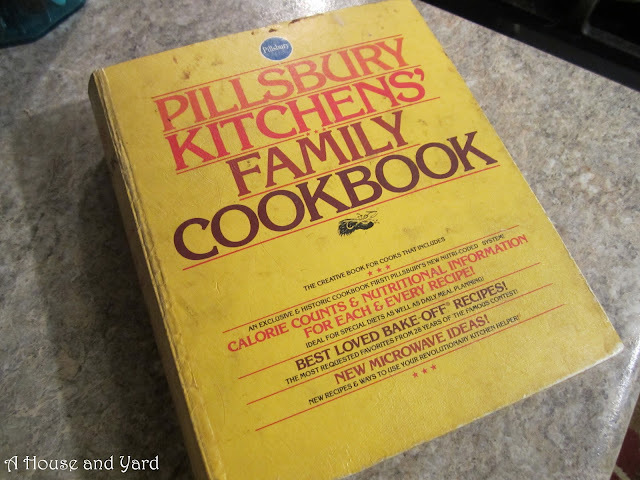 Out came my trusty old cookbook - Pillsbury Kitchens' Family Cookbook. Copyrighted in 1979, this book was a wedding gift to us in 1980. It has seen a lot of love and guided me through a lot of cooking. The bruised apples turned into apple crisp. I may or may not have used extra brown sugar and cinnamon. Oh, all right, I definitely used extra brown sugar and cinnamon! This needed to be eaten right away. 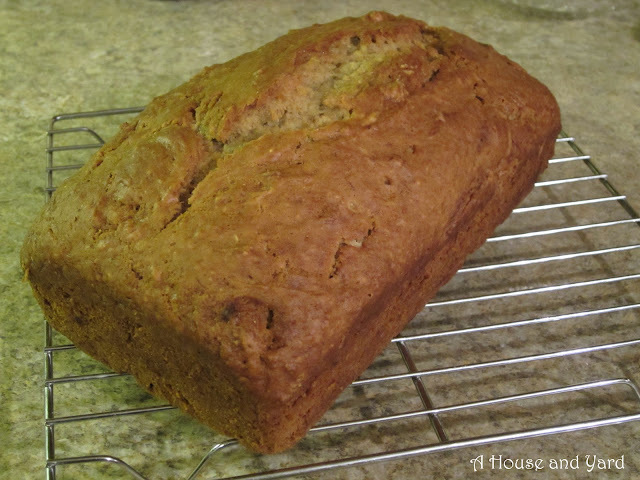 The black bananas were perfect for banana bread. No, I didn't eat this tonight. Well, okay, one small bite to make sure it was good enough. 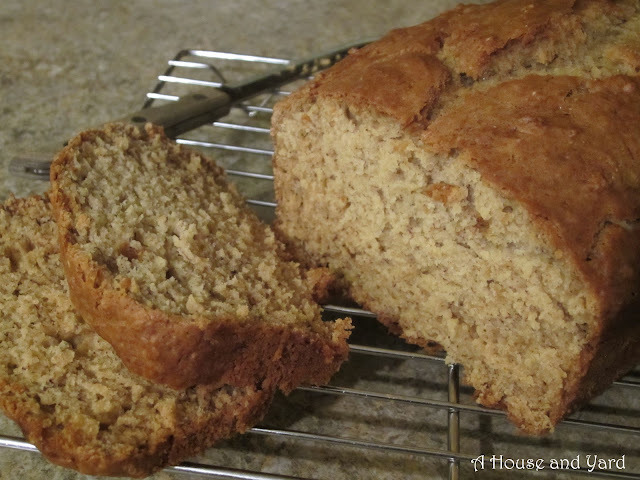 Banana bread for breakfast on Friday! 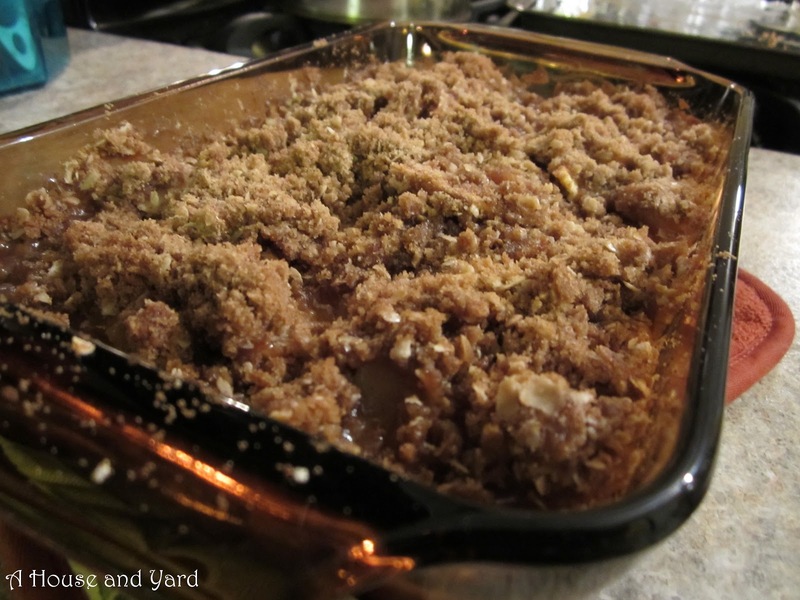 There are few things better than apple crisp and banana bread in autumn. What is your favorite fall baking treat? 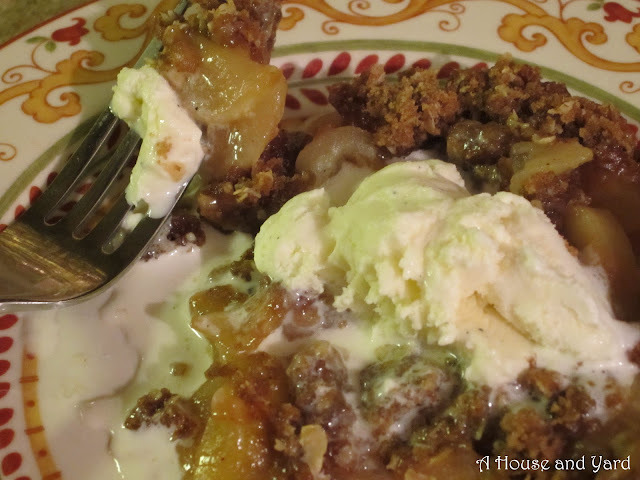 Apple crisp and banana bread are my favorites! Thanks for sharing! Can't wait for Monday! !